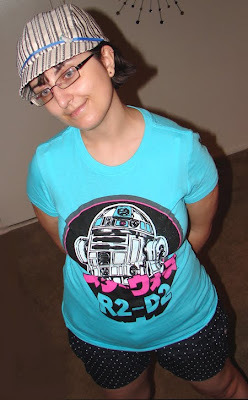 What I Wore: Nerdtastic 07/13/2010 | Oh Sarah O ! I'm not exactly a huge Star Wars fan, but I dig the color of the shirt and it pleases The Boy. I actually got complemented on the shirt while I was out shopping on Tuesday. Speaking of nerdiness, The Boy and I got a Nintendo Wii. So, if I get a little lazy with my blog posts, that is probably what I am doing.